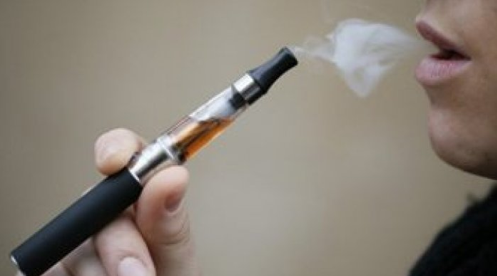 The Food and Drug Administration (FDA) is considering adding a warning label to liquid nicotine amidst the rise in popularity of electronic cigarettes. The federal agency is giving the public 60 days to express their opinion on the subject before they consider how to move forward. On Tuesday, the FDA posted a “notice of proposed rulemaking” on its website. The notice is 15 pages long and asks for “comments, data, research results or other information that may inform regulatory actions FDA might take” with regard to the packaging and any warning labels on liquid nicotine and other tobacco products. Liquid nicotine is commonly found in electronic cigarettes, which come with a replaceable cartridge that’s filled with liquid nicotine. When heated, the liquid nicotine turns into vapor and gets inhaled. The FDA says that the rise in popularity of e-cigarettes “has coincided with an increase in calls to poison control centers and visits to emergency rooms related to nicotine poisoning,” creating a potential need for warning labels. The use of conventional cigarettes has gone down, but use of e-cigarettes has surged in recent years, particularly among teenagers. According to the Centers for Disease Control and Prevention, e-cigarette use among high school students increased from 4.5% in 2013 to 13.4% in 2014, while conventional cigarette smokers dropped from 12.7% to 9.2% over that same time period. The FDA currently has the authority to regulate traditional cigarettes, smokeless tobacco, and roll-your-own tobacco. However, last year the agency proposed rules expanding its authority to cover e-cigarettes, hookah, cigars, and several other forms of tobacco. The FDA is also concerned about inadvertent exposure to nicotine in infants and children. In addition to considering placing warning labels on liquid nicotine, the FDA is also asking for input on requiring some tobacco products to be sold in child-resistant packaging.